John Degenkolb (Argos-Shimano) continues to bogart the bunch sprints in the Vuelta a España, as the German blasted to stage 10 into Sanxenxo, stomping out the chances of Nacer Bouhanni (FDJ-BigMat), who was second, and Daniele Bennati (Radioshack-Nissan) in third. Degenkolb is now four out of four in sprint stages in the Vuelta, after he also got stages two, five, and seven. Other sprinter’s teams again took up the primary workload from 30km out, as the breakaway duo of Adrian Palomares (Andalucia) and Javier Aramendia (Caja Rural) was swept up for good just outside of Sanxenxo, with the peloton leaving town for a circuit loop of nearly 40km before rounding back into the city. With the break caught, Orica-GreenEdge led early, working at a tempo that discouraged attacks. Rabobank and Katusha were also present, but Sky Procycling hit the front with 15km to race. They would not, however, use Chris Froome in the lead out this time, and left British road champion Ian Stannard as the last available engine with 5km to race. No team could grab primary control with 3km to go, but everyone safely navigated a roundabout under the 1km banner, and Argos Shimano’s Koen de Kort came forth to lead out Degenkolb. The big sprinter and current points classification leader was sprung with still nearly 500 metres to race, but Degenkolb again proved his ability to extend his kick. Bouhanni was properly in the German’s wheel, with Bennati just behind. The Frenchman timed his move out of Degenkolb’s slipstream well, but lacked any power to get around, as Degenkolb held off Bouhanni by more than a bike length. Bennati was third and Gianni Meersman (Lotto-Belisol) showed late speed in coming up for fourth. “The sprint was really hard. In the final, we was really fighting,” Degenkolb said at the finish. “The stage in general was not that hard. We [the sprinter’s teams] controlled the race the whole day. On a sweltering day in the Galicia region on the western edge of Spain, the peloton settled in for a rare day of relative relaxation after yesterday’s rest day. With flat stages few and far between, the bunch relished the opportunity to let an unthreatening duo go up the road and take a day to cruise. Palomares and 2012 Vuelta breakaway specialist Aramendia had a maximum lead of seven minutes at one point, but the peloton was quickly on them. Without working too hard, the bunch had the duo within 90 seconds with still 75km to go. Pim Ligthart (Vacansoleil-DCM) used the opportunity to attack in an attempt to bridge to Palomares and Aramendia, but as if reminding Ligthart that he packs a sprint, his team called him back to the peloton and would later try to set him up in the bunch kick. With the break so close and still a large handful of kilometres to ride, the peloton shut off again, and the escapees were quickly back out to three minutes. After another lull to add fuel, the main bunch heated up again, halving its new deficit with 45km to the finish. Sensing his disadvantage in the points classification with the mountains looming, Degenkolb snuck out for the final point at the intermediate sprint in Combarro. Through the finish for the first time in Sanxenxo, the bunch was within five seconds of Palomares and Aramendia, though the duo would briefly pull back out to 20 seconds and a bit more sponsor time. Orica-GreenEdge, Katusha, and Rabobank lined out at the front of the chasing pack, and the leading Spaniards were back in for good with 33km to go. Orica-GreenEdge did most of the work over the next 15km, before disappearing and allowing Sky to take over. Hoping to set up Ben Swift, the British squad worked for the next ten kilometres. Then it was Vacansoleil-DCM, finally ready to release Ligthart, as well as FDJ-BigMat for Bouhanni who came to the front. 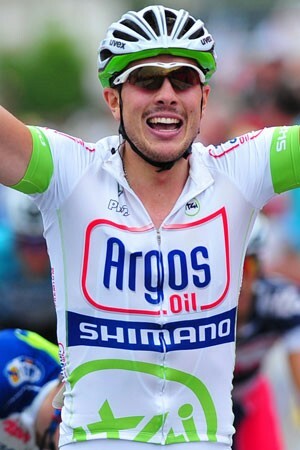 But Argos-Shimano again had Degenkolb well placed at the right time, only appearing for the first time with less than a thousand metres to race. The Dutch team’s small lead out train meant that Degenkolb was left alone early, but for the fourth time, the sprinter did not let anyone around. Joaquim Rodriguez (Katusha) maintains his 53-second lead over Froome with the 40km time trial tomorrow.